Note this article was depreciated on 12-29-2009 - Read about new version here... After a lot of testing and optimization of the internal driver code, we are ready to release the first version of the CL-Eye multicam driver. For your reference, below is the diagram of the internal components of the driver. For a single camera configuration the 'Image Stitching' component is bypassed. 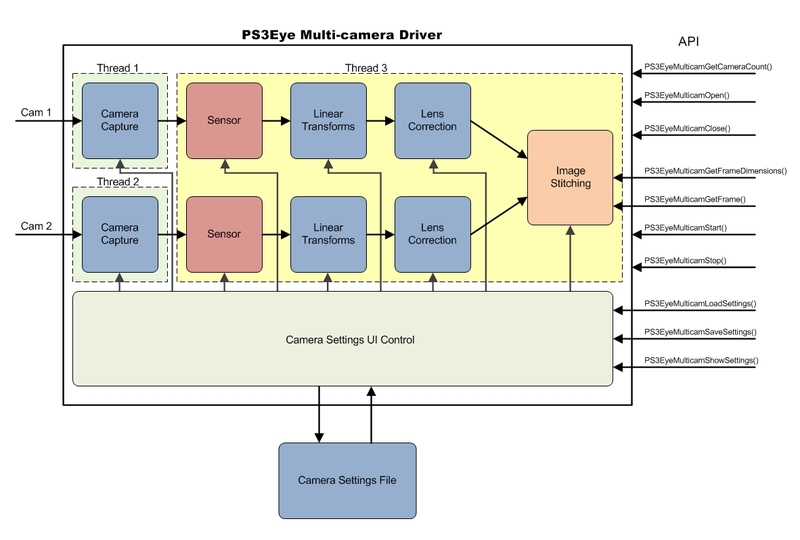 The driver exports simple API that allows for full control of PS3Eye cameras. I chose a C style export functions this time to allow for easier integration with different programming languages such as C#. Here is the 'PS3EyeMulticam.h' file that you would normally include in your code: Included in the driver archive is a full source code of a simple 'PS3EyeMulticamTest' application that allows you to run and test the multicamera driver. // Copyright 2008,2009 (c) Code Laboratories, Inc.  All rights reserved. // and add all the files in this folder to it.